Starting with Apple’s iPhone, ARM has conquered the mobile market and its next plan is to join the club of manufacturers of world’s fastest computers. 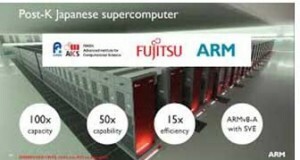 As per the recent development, ARM’s new supercomputer chip design with extensible version is finalized to be the part of Japan’s Post-K computer which is expected to be completed in 2020. The supercomputer market is apparently lucrative for ARM, where the company has no presence. The newly developed chip design (having mobile origin) has extensions and tweaks to boost computing power. A point to be noted here, the ARM’s ambitious plan has come to light only a few weeks after Japanese company Softbank announced that it would buy ARM for the huge amount of $32 billion. It is being predicted that ARM, with these funds, is going to focus on servers and the internet of things. The new chip design by ARM will serve the company’s goals in two ways. First, ARM has declared its strong challenge to existing supercomputing chip developers such as Intel, IBM and others. ARM further plans to join a race among countries and chip makers to build the world’s fastest computer. Countries like the U.S., Japan, and China want to be the first to reach the exascale computing threshold, in which a supercomputer delivers 1 exaflop on performance (a million trillion calculations per second). Intel, IBM, and Nvidia have also been pushing the limits of chip performance to reach that goal. Under the light of Softbak ARM deal, it is absolutely clear that the first supercomputer based on this new chip design will be installed in Japan. Fujitsu is going to develop this Post-K supercomputer. In June Fujitsu dropped its trusty SPARK architecture and joined ARM in order to develop high performance computers. ARM is receiving a significant aid by Fujitsu in the development of new chip. In the comparison of the K computer, the new generation Post-K super compute is designed to perform 50 to 100 times faster . The K computer holds the position of fifth fastest supercomputer in the world and delivers 10.5 petaflops of peak performance with the Fujitsu-designed SPARC64 VIIIfx processor. Let’s discuss the architecture of the ARM processor design. This will be based on 64-bit ARM-v8A architecture and have Scalable Vector Extension which is actually a vector processing extension. The early supercomputers were based on Vector processor. Then in the early 1990s, they shifted over to less expensive IBM RISC chips and general-purpose x86 processor in supercomputers. Still, it is the finest performing server today. It was the year 2013 when researchers expressed their view that less expensive smartphone chips similar to this ARM’s would ultimately replace x86 processors in supercomputers. But, as the time passes, vector processing again gained a remarkable reliant and now it is having a resurgence with ARM’s new chip design and Intel’s Xeon Phi supercomputing chip. ARM’s new chip design is highly efficient in reducing power consumption and can crank up performance at a remarkable level. It is a big thing because as the supercomputers’ speed is growing, the power efficiency has not been achieved in its proportion. The ARM’s chip design will also be part of an influx of alternative chip architectures outside x86 and IBM’s Power entering supercomputing. The world’s fastest supercomputer called the Sunway TaihuLight has a homegrown ShenWei processor developed by China. It offers peak performance of 125.4 petaflops. For a half of the decade, ARM has played its part in the server game, and with the new chip design it is now in a challenging position against Intel which is known as a data center dominator. Large server clusters are being built for machine learning, which could use the low-precision calculations provided by a large congregation of ARM chips with vector extensions. When we take a look of ARM’s server business, it does not seem in a great promising position. Servers by the company are already available but not having the wide response. Dell and Lenovo have tested them and found good, but they are also holding their order till the demand grows which has not happened right now. ARM server chip makers are also struggling and hanging on with the hope the market will take off someday. AMD, which once placed its server future on ARM chips, has reverted back to x86 chips as it re-enters servers. Qualcomm is testing its ARM server chip with cloud developers, and won’t release a chip until the market is viable. AppliedMicro scored a big win with Hewlett Packard Enterprise, which is using the ARM server chips in storage systems. Other ARM server chip makers include Broadcom and Cavium.